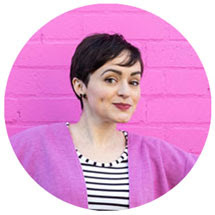 "I’d like to say big thanks to Tilly for including me in such an amazing and inspiring group of stitchers. I feel very honoured to be here. I live in Old Street in Central London, in a small flat with my fella Tim. Luckily for me I have a 350 sq ft sewing studio in Stoke Newington, so I escape there to do my creative stuff. I’ve been sewing all my life, and has given me an income my entire adult life. I can’t imagine never sewing again, it’s both my job and my passion. 1. 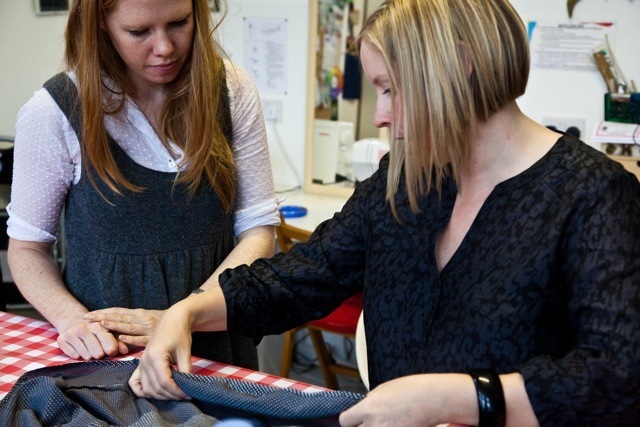 Freelance Theatre Wardrobe Mistress and Costumier - most recently for the play The Audience at the Gielgud Theatre. This involves preparing Costumes before each show. 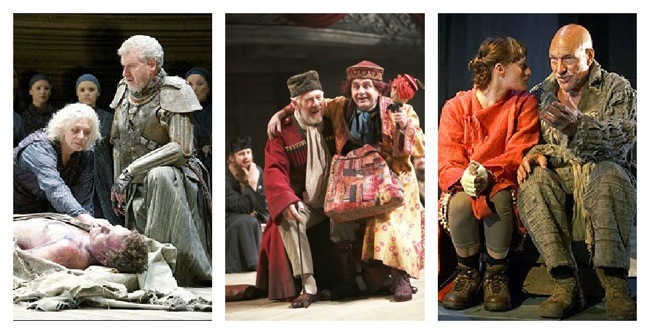 I’ve been lucky enough to have toured the globe - I’ve pressed togas in Michigan for Sir Patrick Stewart, fixed trousers in New Zealand for Sir Ian McKellan and darned Vanessa Redgrave’s hem in Greece. 2. As The Thrifty Stitcher I teach sewing in my lovely studio in Stokey. 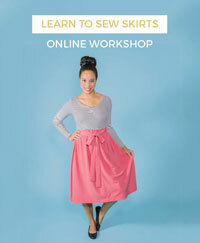 My passions are helping people conquer their fear of the sewing machine, and making dressmaking simple. 3. 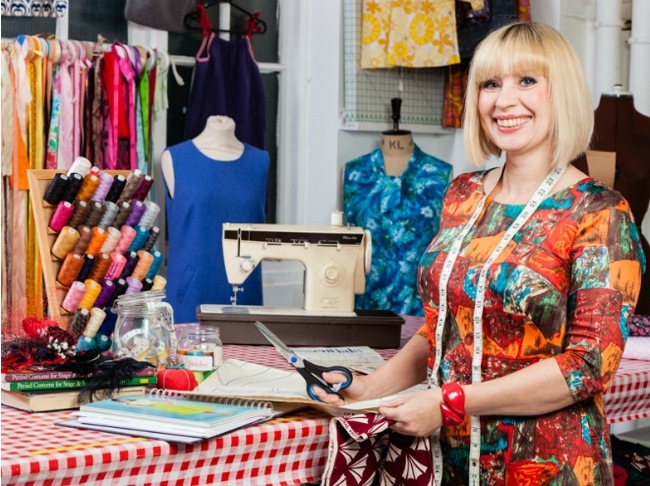 Sewing Advisor to BBC2’s The Great British Sewing Bee. This involves sourcing tools and fabrics needed throughout the series, collating and researching patterns, and answering lots of questions the production team have about anything sewing related. I’m excited about the forthcoming second series which is my next big project, but I’m sworn to secrecy about the details. The strangest thing I’ve ever sewn was a silver leather jock strap for a dancer. That was an awkward fitting… The sewing I’m most proud of - it was a real privilege to sew my sister’s wedding dress and help her have the dream dress she’d designed. Things I wish I’d never sewn - as a teen in the 1980s I made a lot of very hideous clothes. Thankfully none of them exist today to haunt me. My morning starts anywhere between 7am and 11am, depending on the day ahead and what I’m juggling. I am definitely not a morning person, so I try to do all the mundane tasks first thing. My “weekend” is a Monday, and that’s when I have a lie in. I cannot start my day without breakfast, usually just cereal, or porridge, and I need at least two cups of black tea before I’m human! Before setting out for the day, I catch up with my admin. I usually need to plan the logistics of the day’s tasks, as I am not only juggling roles, but different locations too. Late morning I try and do any shopping or class prep at the studio, as this is near to my home. Running a small business means wearing many hats, so once I get to the studio, I mop the floor, make sure the biscuit tin is full, organise patterns /materials and get the room ready for classes. I squeeze a lot into every day, and eat my lunch on the run. I’ll have some salad or soup and coffee. I’m very lucky with the location of my studio, it’s opposite a fabulous park, and if the weather is dry, I’ll sit out in the park to eat lunch. Just a 15 minute breather in the fresh air really clears my head! Once I’m done with lunch it’s a bus and tube hop from Stoke Newington into the West End. Travelling gives me time out, and I try and carry a book so I can zone out. I’m a total crime nut, and have worked my way through a stack of very gory books. My afternoons are spent preparing the costumes for the evening performance. Unlike regular clothes, costumes in the West End are worn every single night, and anything next to the skin needs laundering and pressing every day. Items like dresses and suits are pressed or steamed every day. There’s around 3 hours of pressing/steaming and sock matching on The Audience every day… Luckily I have a couple of assistants help me with this. At the end of every show there’s a list of repairs to do before the next one. If I’m lucky this is just a loose button, but I’ve had days where sleeves have ripped out, loads of hems are down, shoes need cobbling, and there’s a massive rip to be darned. On those days, I have to ensure I allow extra time to get everything done in time. In the past that has involved some very scary sewing, including finishing sewing a new zip into Dame Helen Mirren’s dress 15 minutes before it was needed! Between 5.30pm and 6.15pm I usually get a break, and often this is when I’ll try and catch up with all the things that inspire me, whilst I eat my dinner. It’s so easy to get bogged down with work, that you don’t keep up with the things that make you happy. Throughout the evening I am on standby in case an understudy needs costuming, or a repair crops up last minute. I have been called to the stage to sew up Peter Pan’s trousers whilst he swung above me in a harness. My evening ends at around 10.30pm after I’ve sorted all the washing. On Sundays I try and hang out with my man, as he’s on tour and we don’t see each other through the week. The best advice I’d give anyone wanting to start a sewing business would be to follow your heart. Sewing for a living isn’t the same as sewing for pleasure, and you need to be prepared to sacrifice having a hobby. Having sewn professionally for 21 years though, I can’t imagine doing anything else." Aw... thanks for sharing your day, CL! Readers, catch up on more Days in the Life of inspirational stitchers, including Tasia Sewaholic, Lucie Summers and Sublime Stitching.